Geoffrey Baer sets his sights on a viewer’s childhood memory of a hunter’s wild trophy that decorated a gun shop in a downtown department store. And: Chicago is known as the Second City, but is it first in bridges? We do the math. In the old Marshall Field’s Building, I remember being fascinated as a child in the 1950s by an obscure corner on an upper floor which was occupied by Abercrombie & Fitch which was then not a purveyor simply of T-Shirts with their name on them hawked to unsuspecting adolescents and mindless skinny jeaned nuevo-faux-hipsters but an outfitter (non-urban) of African-style safaris. There was a stuffed Kodiak bear on display which, my diminutive size at the time notwithstanding, must have been 8-10 feet tall. Can you verify this vague childhood memory for me and perhaps even track down the fate of the beloved, if terrifying, stuffed bear? 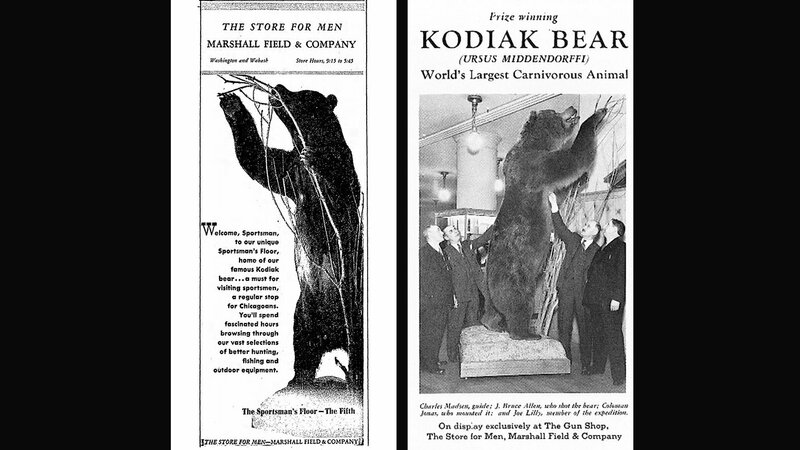 There were actually two enormous mounted Kodiak bears, one about 10 feet and the other about 11 feet tall, in the Marshall Field’s Men’s store, across Washington Street from their flagship store. One bear was on the 4th floor, and the other was on the 5th floor, called the Sportsman’s Floor, in front of the gun shop. (It wasn’t an Abercrombie & Fitch, though – that was associated with a different department store, Von Lengerke & Antoine.) That’s right – Marshall Field’s had a gun shop. You could actually buy all sorts of guns and rifles at department stores in Chicago until ordinances restricting gun sales were enacted starting in the 1970s. The Kodiak bear specimens were killed on Kodiak Island, Alaska, in 1935 by the Chicago businessman and hunter J. Bruce Allen, who donated them to the store for display. And not only could you buy at the gun shop the firearm that felled these bears – a thirty-aught-six rifle, for the record – you could also arrange for your own expedition to Kodiak Island through their outfitters. The bears were on display at least into the ‘50s, but unfortunately we couldn’t find any information about what happened to them after that. Macy’s did confirm that they are no longer in their building, though. By the way, our viewer is in good company with this memory – the famous playwright David Mamet wrote reverently about his recollection of the bear in a piece for the Chicago Tribune in 1990. What is the total number of bridges in Chicago? Is it more than in Venice? According to bridge expert Patrick McBriarty, author of the book “Chicago River Bridges,” Chicago has 122 bridges for vehicles and railroads spanning the Chicago River, the Calumet, Grand Calumet and Little Calumet and the Sanitary and Ship Canal. The Chicago Department of Transportation gave us a slightly lower number, but even they referred us to McBriarty for the most comprehensive count! That said, we definitely do not have more bridges in Chicago than Venice, where there are more than 400 bridges over the many canals. But Hamburg, Germany, has about 2,300, making it the city with the most, according to the Guinness Book of World Records. Amsterdam comes in at number two with well over a thousand. Back stateside, Chicago is still the Second City to New York City, where there are 139 bridges over water, based on a count we cobbled together from their Departments of Transportation, Public Transit and Port Authority. And while Pittsburgh touts itself as the “City of Bridges,” claiming 446, we found that only 66 span waterways. Chicago’s real worldwide claim to fame is moveable bridges. We have 60 of them, 37 of which are still fully operational, according to both McBriarty and CDOT. Only Amsterdam has more. And Chicago is where several of the world’s most popular types of moveable bridges were invented. The most famous is the trunnion bascule bridge, known worldwide as the Chicago Bridge. All bridges in downtown Chicago are of this type. Bascule is the French word for seesaw and each leaf of these bridges is like a giant asymmetrical teeter-totter that rotates around an axel called a trunnion. Huge counterweights are hidden under the bridge leaves. The first one in the world was built in 1902 across the North Branch at Cortland Street, which was recently restored but doesn’t open anymore. Another type of bridge invented in Chicago is the Scherzer Rolling Lift bridge. Instead of rotating around a trunnion, these bridges roll back on runners like a giant rocking chair. The Cermak Road Bridge on the South Branch of the Chicago River is the last surviving example here. In industrial areas you’ll find hulking vertical lift bridges, where the huge center span glides up and down between tall towers. My favorite is in Chinatown. Chicago also still has several examples of 19th century swing bridges. These rotated around a post in the center of the river, but again, they no longer operate. Nowadays, downtown Chicago bridges are usually opened only a few times in the spring to allow sailboats to travel from downriver marinas into Lake Michigan and then again in the fall to return. But in earlier times, commercial traffic even downtown required bridge tenders around the clock. Note: This episode of Ask Geoffrey first aired on “Chicago Tonight” on Jan. 24, 2018. Did you know that you can dig through our Ask Geoffrey archives? Revisit your favorite episodes, discover new secrets about the city's past, and ask Geoffrey your own questions for possible exploration in upcoming episodes. Find it all right here.